ෆොරෙක්ස් ගනුදෙනු සජීවීව දැකගන්න සහ තමන්ටත් ගනුදෙනු කරන විදිය ලබාගන්න. SMS/Text: 078 5154798 SMS (Text) Only. Send us your email address and your payment method with your message, and it is better to include your mobile number as a reference when you make your payment Rs.1000 (or $7)/month. Learn about the most important MQL4 commands and functions to develop MT4 indicators. Forex Signals වල Targets තහවුරු කරගන්න එක සමහර වෙලාවට Open Price එක හොයාගන්නවටත් වඩා අමාරු වෙලා තියෙන්නෙ. ඒක නිසා Forex Signals වලට උපරිම Target එකක් දෙන්නෙ නැති උනත් සමහර විට මං Upload කරන Videos වල උපරිම Target එක ගැන අනුමානය කරන්න ඉඩ තියනවා. ඕනම කෙනෙකුට පුළුවන් ඒ YouTube Channel එකේ Subscribe Button එක Click කරාට පසුව පෙන්වන Bell Icon එකත් Click කරල තමන්ගෙ Email Inbox එකට Video එකේ Link එක ඉක්මනින්ම ලබාගන්න. Video එකේ හොඳ හෝ අඩුපාඩු තියනවානම් ඉක්මනින්ම Comment කරල කියන්න. ලොකු අඩුපාඩුවක් පෙන්වල දුන්නොත් ඉක්මනට ඒ ගැන හොයල බලල ඒ Video එක යටින් ඒ ගැන Comment එකක් මාත් දානවා. Videos Upload කරන්න බැරි වෙන දවස් තියෙන්නත් පුළුවන්. Subscribe කරන අය වැඩි වෙන විදිය අනුව තමයි Videos වල ප්‍රමිතිය තීරණය වෙන්නෙ. ෆොරෙක්ස් ගනුදෙනු සිදුකිරීමේදී අවදානම අඩු කර ගැනීම සඳහා තමන්ගේ ගිණුමට සහ හැකියාවට සාපේක්ෂව ප්‍රායෝගික සැලැස්මකට අනුව මුදල් කළමනාකරණය කරගැනීම අනිවාර්යෙන්ම අත්‍යවශ්‍යවේ. It is better to manage the risk of orders to use a small trading account. මුලින්ම ආයෝජනයක් නොකර නොමිලේ ආදර්ශ (demo) ගිණුමකින් මාව Follow කරන්න. 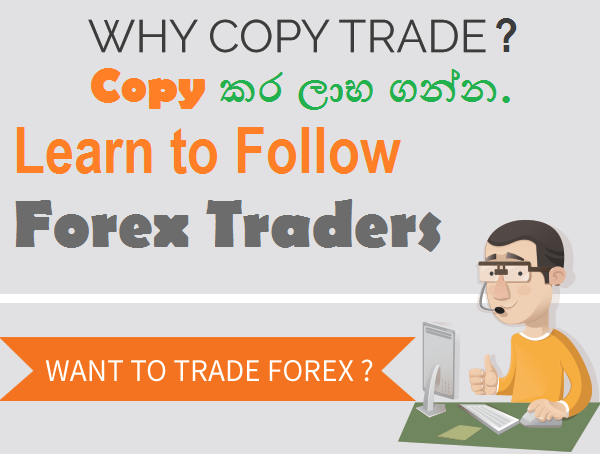 Forex Copy Trading Started By The Best Forex Trader in Sri Lanka.! මං ෆොරෙක්ස් ට්‍රේඩින් කරන විදිය බලන්න මෙතනින්: https://goo.gl/jZv14u හිමින් පටන් ගත්තෙ, ඒත් දැන්නම් ටිකක් අවදානම (risk එක) වැඩි කරලයි ගනුදෙනු කරන්නෙ. වැඩි අවදානමක් ගන්නෙ නැතුව ටිකක් පරිස්සමෙන් මගේ ඒ ආදර්ශ (Demo) ගිණුම අනුගමනය (Follow / Copy Trading) කරන්න. My ZuluTrade Forex Trader Demo Account: https://goo.gl/jZv14u You can make a free demo account first to follow me. ආයෝජනයක් නොකර නොමිලේ ආදර්ශ (demo) ගිණුමකින් මාව Follow කරන්නත් පුළුවන්. Demo ගිණුමකින් හෝ Real ගිණුමකින් මගේ ගිණුම Follow කිරීම (Copy කිරීම) සඳහා මෙම වෙබ් අඩවියට ගොස් https://goo.gl/jZv14u එහි ඇති Follow බොත්තම එබූ විට (Click කල විට) ඔබ දැනටමත් ගිණුමක් සාදා ඇත්නම් Login බොත්තම එබීමෙන් හෝ අලුත් ගිණුමක් සෑදීමට Create Account හෝ Register බොත්තම එබීමෙන් පසුව පැමිණෙන පිටුවට ගොස් ලියාපදිංචි වීමේදී මාගේ ගිණුම පමණක් Follow කිරීමට අවශ්‍ය $600 ක් හෝ ඊට වැඩි මුදලක් ඇති ආදර්ශ (Demo) ගිණුමක් හෝ සත්‍ය (Real) ගිණුමක් (මෙහි පෙන්වා ඇති පරිදි http://www.ranrahas.com/page.php?38) සෑදීමෙන් පසුව නැවතත් මෙම පිටුවට ගොස් https://goo.gl/jZv14u එහි ඇති Follow බොත්තම එබූ විට මාගේ ගිණුමෙහි දැනට යොදා ඇති ගනුදෙනු සමග හෝ ඒවා නොමැතිව මාගේ ගිණුම ඔබගේ ගිණුම සමග සම්බන්ධ කරගැනීම තහවුරු කරගත හැක. ෆොරෙක්ස් සිග්නල්ස් ගන්න කෙනෙක් සමග SMS හරහා සිදුකල කතාබහක කොටසකි. Epa. Man alert ekak ewanakan inna. Aparade. Man GBPUSD trend eka confirm karaganna kalinma udata giya. Thank you mall I. Digatama signals ewanawa. Thawa tika dawasalin wadipura signals ewanna balannam. Hodai. Math thaama himin yanne, loku risk ekak gannath bahane. Thawa tika kaalayak balamu. Baya wenna deyak naha man digatama awrudu gaanakma ewanna inne. Gaana wadi karanna balaporotthuwaluth naha. Matath tikak lehesi wadak. Dan signal ekak ewanna balannam. Malli oyage msg eka copy karala mage blog ekakata danmata kamak nadda? Mage Forex Signals reviews man thaama daala naha. Thank you very much malli. Man yawana signals hodai kiyala man kiwwata vitharak hari yanne nahane, samahara aya magen reviews illuwa pennanna kiyala. Ekai man mallita kiwwe. OK thank you malli. Dan apahu charts tika balanna yanne. Thawath hoda vistharath ekka passe kathaa karamu. Ok malli. Gd night & Bye for now..
මෙලෙස තවත් කිහිප දෙනෙකුගෙන්ම අපගේ ෆොරෙක්ස් සිග්නල්ස් සේවාව පිළිබඳව ඉතා යහපත් ප්‍රතිචාර ලැබී ඇත. ★ 1-3 Forex Signals per month for Sri Lankan SMS subscribers. 100-300 pips/month. (Rs.5+tax per day Dialog/Hutch). 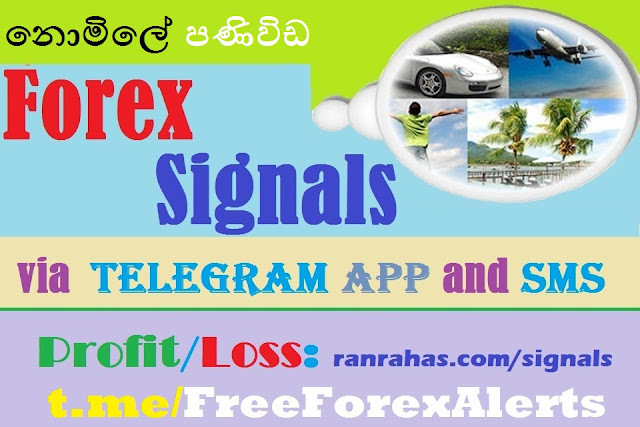 Forex signals SMS ක්‍රියාත්මක කිරීමට: REG RRFX ලෙස සඳහන් කර 77100 ට SMS කරන්න, දිනකට රු.5, (Dialog/Hutch). (Sri Lanka Only). ★ 3-5 per week for subscribers ( Free emails or Local or International SMS charges apply) and Rs.1000 ($7) monthly. Forex Signals for Rs.1000 ($7)/month to get 600pips. දිනපතා හෝ සතියකට ෆොරෙක්ස් සිග්නල්ස් 3ක් හෝ 5ක් පමණ සහ එමගින් මසකට අවම පිප්ස් (pips) 600 ක ලාභයක් ලබාගන්න. ★ 7-9 Forex Signals per week for SMS subscribers (Local or International SMS charges apply, or Free emails) and $25 monthly. Subscription: 1200 pips/month. 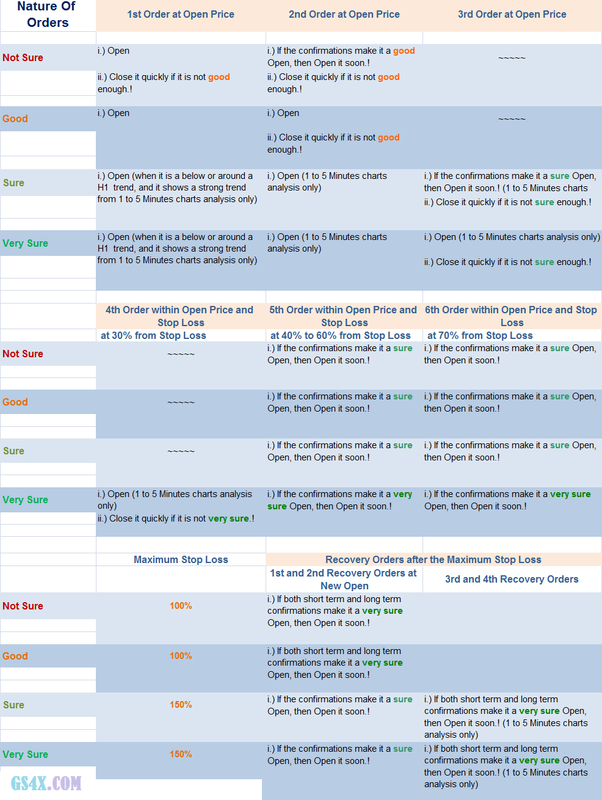 Forex Signals for Rs.3000 ($20)/month to get 1200pips. Send us your email address and your payment method with your message, and it is better if you can include your mobile number as a reference when you make your payment. (+94) 077 8058452 For SMS (Text) Only. (+94) 078 5154798 For SMS (Text) Only. ඔබගේ පණිවිඩය සමග ඊ-මේල් (Email) ලිපිනයද අනිවාර්යෙන්ම ඇතුලත් කර අපගේ දුරකථන අංක වලට SMS පමණක් යොමු කරන්න. ෆොරෙක්ස් සිග්නල්ස් (Forex Signals) ලබාගැනීම සඳහා ගෙවීමේදී ඔබව හඳුනාගැනීම සඳහා හැකිනම් ඔබගේ දුරකථන අංකයද ඇතුලත් කර රු.1000 ක් (හෝ $7 ක්) ගෙවා ඉන්පසුව ඔබ එය ගෙවූ බැංකුවේ නම හෝ අදාල ආයතනයේ නම සඳහන් කර ඔබගේ Email ලිපිනයද සමග SMS එකක් අපවෙත එවන්න. කැමති දිනයකදී මෙය සක්‍රීය කරගත හැකි නමුත් SMS එවීම සඳහා අමතර ගාස්තුවක් (උදා: රු.5+බදු/දවසකට Dialog/Hutch සිම් එකේ ඇති මුදලින්) අයවෙන බැවින් කැමතිනම් මුලින්ම අමතර ගාස්තුවක් නොගෙවා Emails මගින් ලබාගත හැක. SMS ලබාගන්නා අයට Emails ද ලබාගැනීමට අවශ්‍යනම් මසකට රු.150 ක (හෝ $1 ක) අමතර ගාස්තුවක් ගෙවිය යුතුය. ෆොරෙක්ස් සිග්නල්ස් භාවිතා කරන ආකාරය නොමිලේ කියාදෙන අතර මාස 3 ක් ෆොරෙක්ස් සිග්නල්ස් ලබාගන්නා අයට මූලික ෆොරෙක්ස් අධ්‍යාපනික වීඩියෝ පාඨමාලාව (Basic Forex Course) නොමිලේ ලබාගත හැක. දිගටම ෆොරෙක්ස් සිග්නල්ස් ලබාගන්නා අයට විශේෂ ෆොරෙක්ස් ට්‍රේඩින් (Special Forex Trading Course) පාඨමාලාව දක්වා අන්තර්ජාලය හරහා නොමිලේ ඉගෙනගත හැකි නමුත් අපගේ ලිපිනයට පැමිණ ඉගෙන ගැනීමට අවශ්‍යනම් අමතර ගාස්තුවක් ලෙස අදාළ පාඨමාලාවේ ගාස්තුවම ගෙවිය යුතුය. ඔබගේ ගිණුම අපගේ අවදානය යටතේ පවත්වාගෙන යෑමට අවශ්‍යනම් ගිණුම සෑදීමට පෙර අපගේ උපදෙස් ලබාගැනීම සුදුසුය. පුහුණු වීම සඳහා සත්‍ය මුදල් අවශ්‍ය නොවේ. මුදල් ගෙවූ අයට පළමු මාසයේදී නොමිලේ Forex Signals ලැබේ. Beginners Can Start From Here..
★ හැමෝටම trading වලින් සාර්ථක වෙන්න පුලුවන්ද? ★ හොද Forex indicators ගැන දන්නවාද? ඔබගේ පණිවිඩය සමග ඊ-මේල් (Email) ලිපිනයද අනිවාර්යෙන්ම ඇතුලත් කර අපගේ දුරකථන අංක වලට SMS පමණක් යොමු කරන්න. ෆොරෙක්ස් සිග්නල්ස් (Forex Signals) ලබාගැනීම සඳහා ගෙවීමේදී ඔබව හඳුනාගැනීම සඳහා හැකිනම් ඔබගේ දුරකථන අංකයද ඇතුලත් කර රු.1500 ක් (හෝ $10 ක්) ගෙවා ඉන්පසුව ඔබ එය ගෙවූ බැංකුවේ නම හෝ අදාල ආයතනයේ නම සඳහන් කර ඔබගේ Email ලිපිනයද සමග SMS එකක් අපවෙත එවන්න. කැමති දිනයකදී මෙය සක්‍රීය කරගත හැකි නමුත් SMS එවීම සඳහා අමතර ගාස්තුවක් (උදා: රු.5+බදු/දවසකට Dialog/Hutch සිම් එකේ ඇති මුදලින්) අයවෙන බැවින් කැමතිනම් මුලින්ම අමතර ගාස්තුවක් නොගෙවා Emails මගින් ලබාගත හැක. SMS ලබාගන්නා අයට Emails ද ලබාගැනීමට අවශ්‍යනම් මසකට රු.150 ක (හෝ $1 ක) අමතර ගාස්තුවක් ගෙවිය යුතුය. ෆොරෙක්ස් සිග්නල්ස් භාවිතා කරන ආකාරය නොමිලේ කියාදෙන අතර මාස 3 ක් ෆොරෙක්ස් සිග්නල්ස් ලබාගන්නා අයට මූලික ෆොරෙක්ස් අධ්‍යාපනික වීඩියෝ පාඨමාලාව (Basic Forex Course) නොමිලේ ලබාගත හැක. දිගටම ෆොරෙක්ස් සිග්නල්ස් ලබාගන්නා අයට විශේෂ ෆොරෙක්ස් ට්‍රේඩින් (Special Forex Trading Course) පාඨමාලාව දක්වා අන්තර්ජාලය හරහා නොමිලේ ඉගෙනගත හැකි නමුත් අපගේ ලිපිනයට පැමිණ ඉගෙන ගැනීමට අවශ්‍යනම් අමතර ගාස්තුවක් ලෙස අදාළ පාඨමාලාවේ ගාස්තුවම ගෙවිය යුතුය. රු.2500 ක් (හෝ $16 ක්) ගෙවා Forex Scalping Alert Indicators ලබාගන්නා අයට පමණක් pips 600ක Forex Signals සහ ඉන්පසුව රු.2000ක් (හෝ $13 ක්) ගෙවීමෙන් තවත් pips 1200ක Standard Forex Signals හෝ pips 900 ක් සඳහා ගෙවන අයට pips 1800 ක් ද pips 1200 ක් සඳහා ගෙවන අයට pips 2400ක් ද හිමිවේ. වැඩි විස්තර වෙබ් අඩවියෙන් සොයාගන්න (ranrahas.com). පැවසීමට වෙනත් අත්‍යවශ්‍ය යමක් තිබේනම් ස්කයිප් (Skype: suresh.slk) හෝ ඊ-මේල් (text) මගින් දැනුම් දෙන්න. පැමිණෙන අයට පාඨමාලාව ගැන හඳුන්වා දීමක් පමණක් සිදුවේ. සම්පූර්ණ පාඨමාලාවම මා නිර්මාණය කල වීඩියෝ නැරඹීමෙන් ඉගෙන ගත යුතුය. සාමාජිකත්වයෙන් පසුව නවතම වීඩියෝ පාඩම් ඔබගේ ඊ-මේල් ලිපිනය ඔස්සේ නොමිලේම ලබාගැනීමට පහසුකම ඇත.